Time: Late Spring and Autumn period. 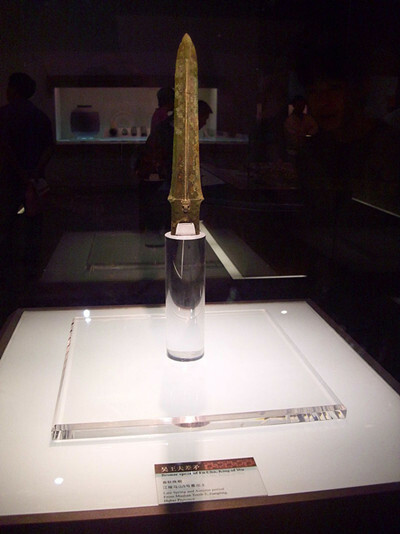 The Spear of Fuchai (吳王夫差矛) is purportedly the spear of King Fuchai of Wu, the arch-rival of King Goujian of Yue. It was unearthed in Jiangling, Hubei in November 1983. The script on it is a kind of script used only in the states of Wu, Yue (state), and Chu called 鸟虫文 or bird and worms script, a variant of seal script. The inscription mirrors the text of King Goujian's Sword, except changing the name of the owner and the type of weapon. In this case, the text reads, "吴王夫差自作用矛" or "[Belonging to] King Fuchai of Wu made for his personal use, this spear."